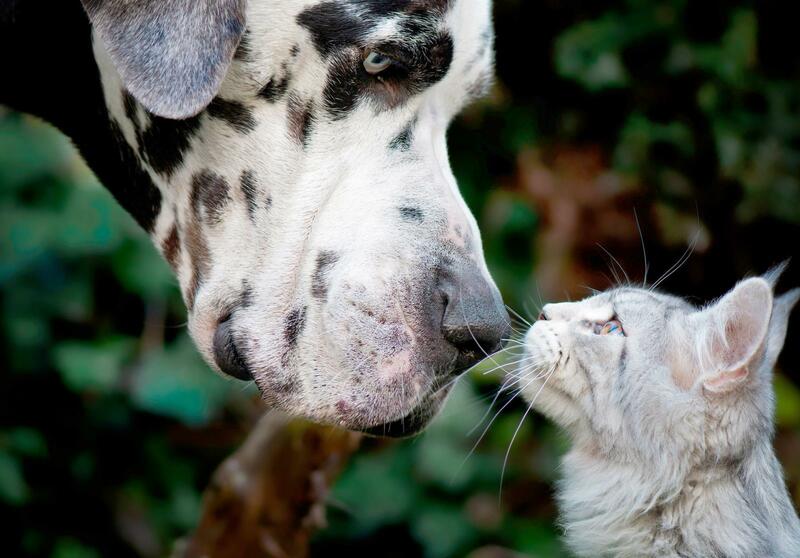 Many believe that dogs and cats are mortal enemies. The truth is, they often live together successfully. The relationship between your cat and dog is dependent on how they're introduced, age, socialization and sometimes breed tendencies. The CDs What Is My Cat Saying? and What is My Dog Saying? have a wide range of cat and dog body language signals. The Dog Decoder app teaches dog body language with easy-to-read cartoons. It's available for iOS and Android. Alley Cat Allies' webpage offers a visual guide to cat body language. It's important to move at the speed of both animal's comfort level. The dog may be eager to meet while the cat is terrified. Katenna Jones, an Associate Applied Animal Behaviorist, cautions, "the most uncertain one needs to determine the speed of interactions." Often it's the cat who determines when you move forward. Keep them separate visually and physically. The cat can be behind a closed door in a bedroom or bathroom. Do not allow the dog to get near the gap beneath the door. You can stuff towels under it or use a draft stop to block access. The cat should have everything it needs to be comfortable. This includes a litter box, food and water, toys, elevated spots to enjoy and a comfortable place to sleep. Make sure you don't put their food and water dish next to the litter box. A trick Jones recommends is having each sleep on a blanket. After one night, place each blanket in each other's bedding. Switch them each day so that both get used to the smell of the other mixed in with their own. Do this for a few days or more until neither animal seems uncomfortable with the other's scent. If you observe either pet avoiding the scent of the other's, or urinating on it, contact a behavior professional for help. Now you can create a safe space for your cat if he feels uncomfortable. This can be a room with a cat door where he can get his food, water and a litter box. You should have preferably two litter boxes if there's enough room. Use small steps to achieve your goals. Once you feel ready to move forward, allow the dog to move closer to the door. The dog should be leashed and the cat can be free behind the door. Move the cat food bowl closer to the door if the cat seems comfortable. Continue to move the dog forward if he is not fixated on the door. Provide plenty of positive reinforcement for each pet during the sessions using whatever each pet prefers the most such as treats, petting, praise or toys. It's helpful to have at least one other person who can work with the other animal. If you're by yourself, you could stay with the cat and toss the dog treats under the door. Continue these sessions for no more than 10 minutes and end before either becomes stressed. You may have to do this some time until they are comfortable. Jones explains, "you should do these sessions multiple times a day, for as long as it takes. It could even takes months, depending on the animals." When the cat seems comfortable in his space, allow him to start investigating the rest of the home. While the dog is away or securely confined to a room with a chew or a toy, allow the cat to explore. At first you should close off some rooms to not overwhelm the cat with too much space too soon. After the cat enjoys some exploration time, encourage him to go back to his safe space with treats or play. Once the cat is comfortably in other spaces, it's a good time to let the dog explore the cat's room. Secure the cat in another room with plenty of things to enjoy. Remove the cat's food and litter box and allow the leashed dog to investigate the cat's home for several minutes. Repeat several times until the dog no longer really cares about investigating. You can now allow unsupervised access to the door. Continue as long as everyone is eating and drinking normally, the cat is using the litter box and neither is fixated on the door. Now you can move to letting them see each other in short increments of time. Use the following tips to ensure successful sessions. Keep them separated using baby gates or screens. You can also crate the dog if he is calm, enjoys his crate and does not appear agitated. Give him a bone or a chew toy so he has something to do. Never crate or restrain the cat as this will make him feel trapped and will exacerbate his anxiety. Control the dog's access to the gate with a leash or tether calmer dogs with a leash to a piece of heavy furniture. The person handling the dog should work on rewarding and praising him for two behaviors. You want the dog to look calmly at the cat and also to look at you when you ask for his attention. The goal is to find a spot that is close enough between them where the cat is interested, but not so close they get overly excited. Jones cautions, "you want to ensure the dog stays calm, even if he is friendly, as this can upset the cat." Allow the cat to approach the gate and do not chase him if he runs away . Reward him for spending time closer to the gate with delicious treats, but don't push them. Shyer cats will need more time to feel confident approaching the dog. During these sessions continue pairing the interactions with good things like food, treats, a favorite toy, grooming or petting. Make sure the toy you choose for the dog is one he plays calmly with rather than a squeaky toy that makes him hyper. You can also use clicker training to shape good behavior for both animals. Do not hesitate to get professional help! Make sure you work with someone qualified to work with cats and behavior, such as a veterinary behaviorist or a certified cat behavior consultant. The next steps involve getting the animals even more acclimated to one another. Once they seem calm and relaxed during these sessions, remove the gate. Do this for short, controlled sessions of about 10 minutes. Your dog should be leashed, under control, and able to take their attention off the cat. If he is calm, he can crated. Your cat should be leashed if you're concerned about him moving aggressively at the dog. Allow the cat to move around and be prepared to intervene if necessary. The cat must be able to move toward or away from the dog when he wants to. Never hold the cat during these interactions. It can make the cat feel unsafe and you can get hurt if the cat frantically attempts to escape. Continue to praise and reward both pets anytime they move toward or look at each other. Once you feel completely comfortable with their controlled interactions, and each seems stress-free, make your interaction sessions longer. Once both pets can be near each other safely, drop the dog's leash so he can drag it. Be sure to continue to separate them when either pet needs a break or you can't supervise them. Over time, allow them more time together, but always be vigilant and supervise them during the first few weeks and months. Install vertical spaces for the cat, such as cat trees and shelves. Jones likes to instruct owners to "create a cat super highway." This is a series of trees and shelves and tops of furniture where the cat can move from one room to the other and the dog can't reach him. Some breeds and dog personalities may not be compatible with cats. 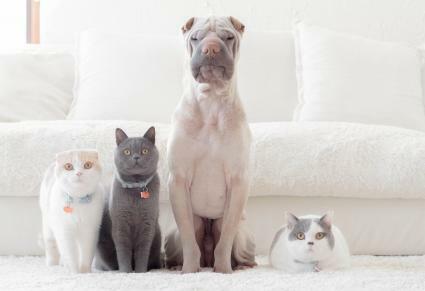 Even dogs that lived with cats in a former home may not be good with cats in a new home. This does not mean that these pairings are impossible but be aware of the potential for problems. You are likely to have a much higher chance for success if they are introduced to each other as puppies and kittens. Another potential reason for aggression is the age of the animal. If they are seniors or approaching old age, they may be less tolerant of other animals due to pain and other medical issues. If you suspect there is a health reason for poor relations, contact your veterinarian immediately for a full check-up. While the process seems like a lot of work and takes time, allowing your dog and cat controlled, short introductions is the best way to create a harmonious household. Cats in particular are sensitive to change and their environment and you should always move at the pace they are comfortable with.